Even with Microsoft's efforts to improve its flagship spreadsheet application, Excel -- increasing the number of cells spreadsheets can accommodate, acquiring a spreadsheet management software maker Prodiance -- companies are in need of more collaborative tools for financial management. Still, many finance professionals cling to their financial spreadsheets like newborn babes to bottles. And while they don't have to give them up completely, it's high time they begin the weaning period. 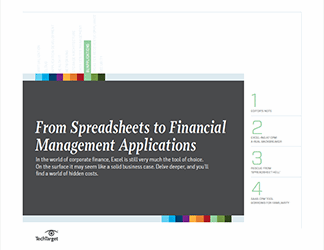 In this three-part guide, written by veteran technology reporters, experts and users alike highlight when and how to determine whether your organization is prepared to migrate to dedicated financial management applications. First, Tony Kontzer points to why using Excel alone -- primarily a tool for individual use -- for financial management is never wise. Next, Christine Parizo details how to determine whether your organization has outgrown Microsoft as the application to handle financial tracking and analytics. 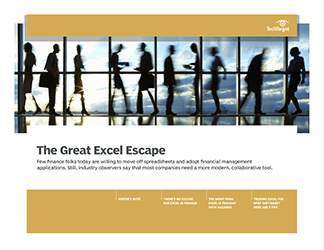 To close, Linda Rosencrance offers up six tips for making the move from Excel to, specifically, more modern budgeting, planning and forecasting software.